Arkansas Hospital Association Chairman Darren Caldwell, CEO of Unity Health - Harris Medical Center in Newport, understands that there is a need for reform in the way Medicaid is administered. But some current proposals to gut or to eliminate the Affordable Care Act (ACA) could be devastating to hospitals by eliminating healthcare coverage for hundreds of thousands of people. Doing that could lead to the uninsured not getting preventive healthcare or primary care, and then using emergency rooms for their needs. Hospitals would be required to provide the care, but wouldn't be reimbursed for the cost of the care. "Gov. Asa Hutchinson supported the Graham-Cassidy Bill," Caldwell said. "I believe the governor is truly trying to figure out how to make Medicaid in Arkansas sustainable. But I do not agree the current proposed methodology would do that. Right now, the government insists hospitals see patients regardless of their ability to pay. To gut the Medicaid program to ration down access would result in the hospital industry being required to pick up services for a population that doesn't understand the need for primary care to be their responsibility. This would be like asking Walmart to continually take on customers that check out and don't pay." Caldwell does see problems with the current Medicaid system. "A smoker doesn't believe it is harmful until becoming ill," Caldwell said. "Exercise often doesn't matter until you've had a heart attack. The population needs to understand the way things are going now is unsustainable. We just disagree that hospitals should be the ones to fund all the changes." Caldwell said until everybody has something at stake, nothing is going to change. "We can't seem to get over the hump with the debate about the ACA and how it is going to be implemented through the State of Arkansas and the country," he said. Caldwell said one thing the healthcare industry is great at is living with perpetual changes. Some of those include advancements in medical treatment. But some of those medical treatments are extremely expensive and can make overall spending in excess of what insurance companies and government programs can afford. "Healthcare is 20 percent of the gross domestic product (GDP)," Caldwell said. "We recognize healthcare is too big a percentage of the GDP, and that it is not sustainable. But healthcare is underappreciated. We need more emphasis on our value to society and less on our expense. A lot of things are overlooked because we don't put the value on it that it deserves. A lot of bills get paid because healthcare and its related industries are successful. We think about healthcare like we think about education; it is a right. So, it doesn't make good sense to put in so many restrictions and criticisms when it is so vital." Caldwell said medicine is a science, healthcare is a business, and healing is an art. "It would be nice if people looked at it as an art instead of being about money," he said. The uncertainly about ACA certainly is a concern for hospitals, especially considering the many other challenges they face. Those include the difficulty of providing adequate staffing for physicians, nurses, lab technologists and other licensed staff members. "It is an extremely shallow pool of graduates for an extremely large industry," Caldwell said. "There are always fewer graduates than there are openings, particularly in the South. The metro areas don't have the strain we have. We find physicians, in particular, are less likely to choose to live in rural areas even though they may be able to make more. In rural parts of the state, unless you grow your own, you are in trouble. It is hard to get young people to dedicate so much time and money for education, and then want to go back home to a rural area." Another issue, he said, is that today younger physicians and other healthcare professionals are often more interested in lifestyle than income. They may prefer urban areas where they have trained because they are on call less, there is more support, and the urban area where they trained is what they are most familiar with. Commuting long distance to work is not appealing to many either, he said. It isn't considered a safe alternative. Caldwell grew up in Dumas, and received a bachelor of science in biomedical engineering from Louisiana Tech. He decided his calling wasn't the design side of engineering, and that he was more interested in the business and public relations side of medicine. His first job after college was working as an assistant administrator at Delta Memorial Hospital in Dumas. His first CEO position two years after college was administrator of the DeWitt Hospital of Nursing. Since 1991, he has worked at hospitals in DeWitt, Dumas and Monticello. He started his current job with Unity Health-Harris Medical Center Aug. 15, 2015. 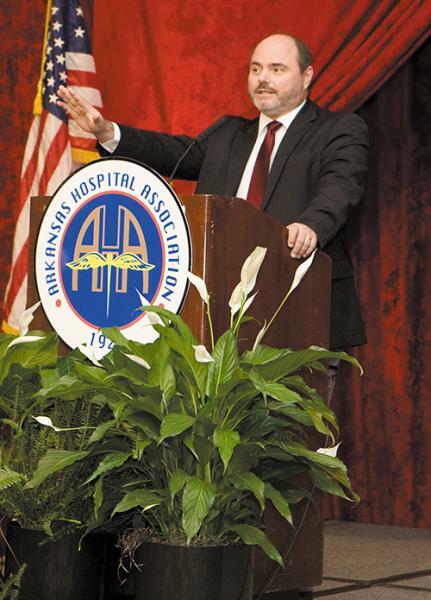 Caldwell sees his role at AHA "to stay out of the way of an excellent staff and let them do their job while making sure they can best serve the membership of the hospital association. I will conduct the meetings. I will be a sounding board when there are issues that relate to the industry." When Unity Health purchased Harris Medical Center in Feb. 2015, it went from a for-profit to a not-for-profit facility. "Since then, one of my challenges has been to create a culture where it can become more mission oriented and less financial oriented," Caldwell said. "We want the people involved with the patients to be involved with the solution. The community has been very supportive of the change. The employees have been very excited about this new culture." Caldwell strives to have a management style that encourages cooperation and frank communication. "I like to create an environment where people feel comfortable to express themselves freely," he said. "I think if you are going to ask employees to speak up, you have to be respectful enough to listen and really hear them. Listening requires work." In 2014 the AHA Board of Directors selected Caldwell as the recipient of the Weintraub Memorial Award, the highest honor bestowed upon an individual by the AHA. Caldwell and his wife, Robin, have three children, Kelsey, 29; Sydney, 22; and Parker, 19; and five grandchildren. The family enjoys camping, fishing, golf, and watching football and basketball. Caldwell played tennis, football and basketball when he was younger.